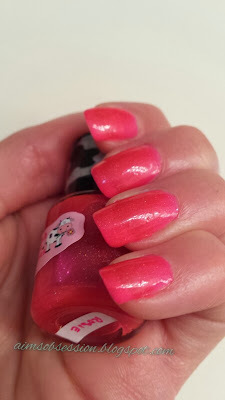 On the blog today is the mystery polish from Polish Yer Hooves. You would have received this polish if you ordered during Leigh Anne's Black Friday sales. It was super cold the past few days so I decided to show you the mystery polish for tonight's post since it is a more dark and vampy color. Don't you worry though. . . as always with Leigh Anne's polishes. . . there is a pop of sparkle! As you can see, this mystery polish is in a square bottle. I thought this was neat since it was different from Leigh Anne's other polishes. Can you see the hints of pink sparkle? They were hard to capture. 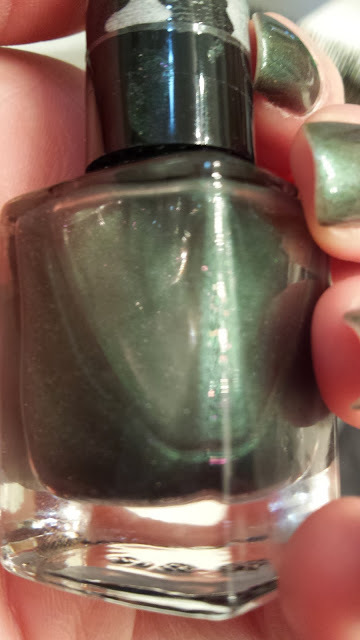 This mystery polish is a really pretty almost olive green color with hints of pink sparkle. I was hoping for a sunny day to capture the sparkle more but the sun was not on my side today. I used 3 very thin coats for this manicure. On my pinky nail there are 4 coats so you can see the color difference if you decide to go an extra coat. Again, I love the formula of these polishes and I have no doubt this color will last for a week or more if I would let it! Can you see the hint of pink sparkle? (Second nail in from the left!) If there is better sun tomorrow I will try to get you a better glimpse of the pink sparkle. (Has to be before I put on my next polish from Polish Yer Hooves though! I have two more to share! Be on the lookout for "It's My Present" and "Snowfall." Currently, this polish is not available in Polish Yer Hooves' online shop but you never know for the future! 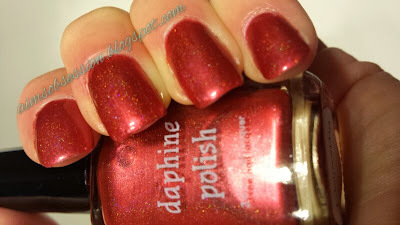 In the meantime why don't you go check out some of her other gorgeous polish?! You can also give her a like on her Facebook page to follow updates. You never know when this one might become available again! Polish Yer Hooves - sister cows! A day late! So sorry! I ended up spending some more family time with out of state family and didn't get the post up yesterday!! Leigh Anne from Polish Yer Hooves had a really awesome sale for her bloggers Black Friday weekend and I took her up on it and snatched up a few polishes so I could share with my lovelies! If you love pink as much as me . 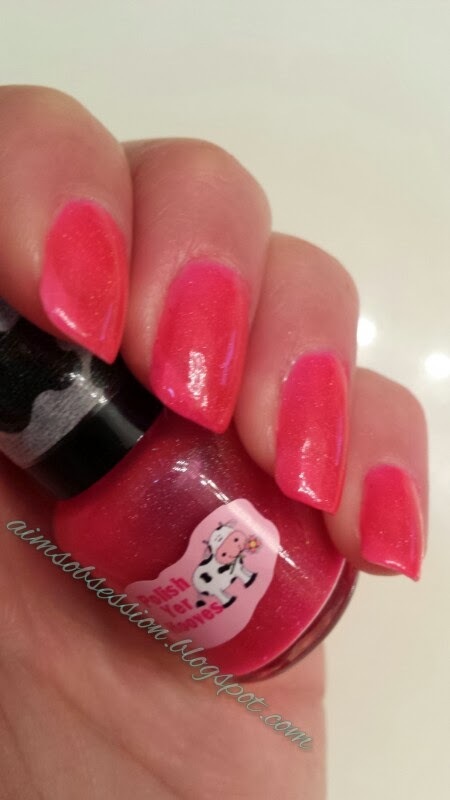 . . you will LOVE these sister cow polishes! Unfortunately I only have 2 of the 3 that are available on her etsy page to show you. 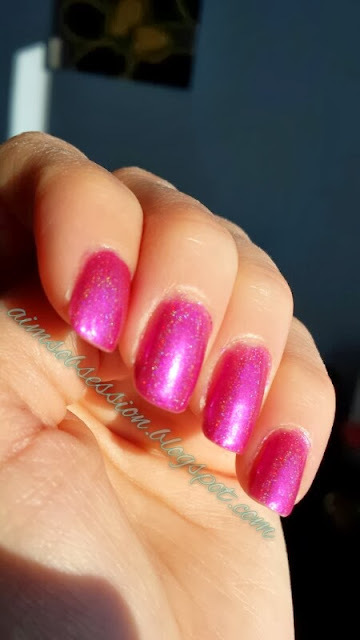 I absolutely love this purplish pink holo polish. She is packed full of sparkle! The above picture is 2 coats. Check out that gorgeous sparkle. <3 I was a huge barbie fan when I was younger and Clover really brings back some fun childhood memories! She has a fabulous formula just like Leigh Anne's other polishes I have reviewed. I loved this one sooo much that I kept Clover on my fingers for 4 days. (No chips!) I'm sure this beautiful polish would have lasted much longer but I wanted to get the other colors out for you to see as well. Sun shot!!!!! Admit it. . . you want to go buy this one right now don't you? I'm pretty sure I see a full size bottle in my future! 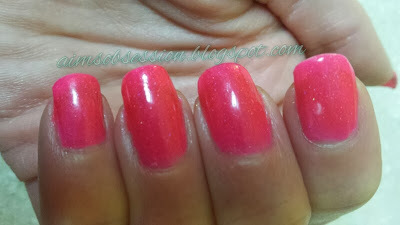 Rosie is a super bright hot pink holo! So gorgeous! If you are tired of the vampy dark winter colors and need a break . . . absolutely go and buy this one! The hot pink in this one was hard to capture with my camera. 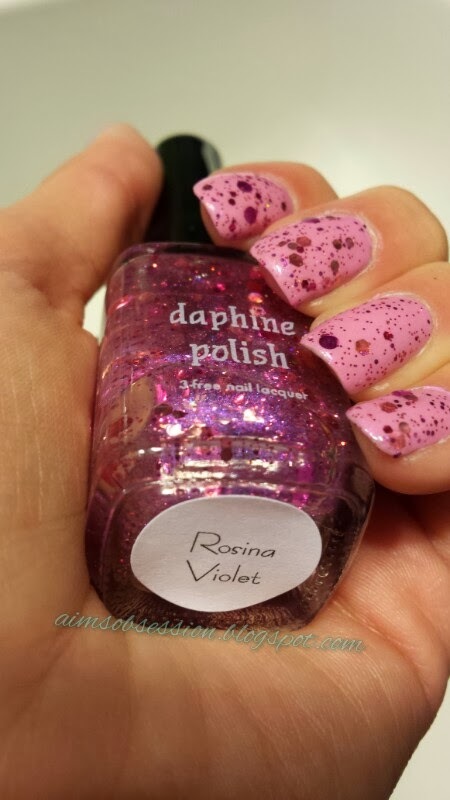 I used 3 coats with Rosie because I like a more opaque look, but she looks lovely with 2 coats as well! The gorgeous just jumps out at you doesn't it? (I was not able to grab a sun shot with Rosie :( ). 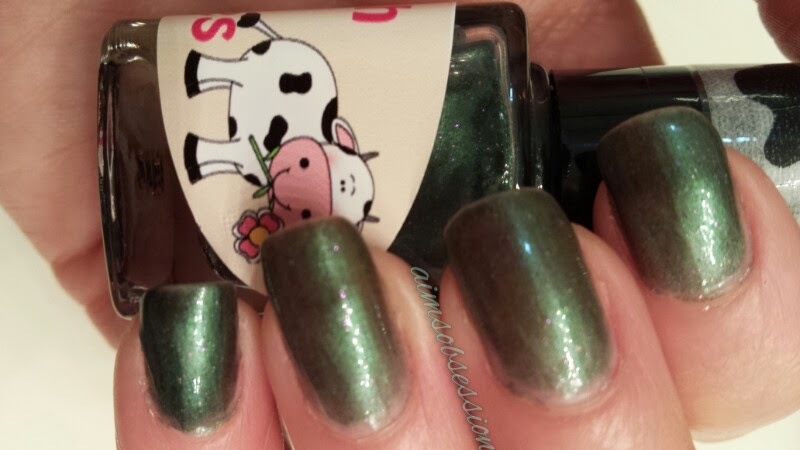 Clover and Rosie are available on Leigh Anne's Etsy page along with their sister cow polish, Elsie for only $9 each. Of course as always if you choose to add a scent (which is always fun!) it is only 50 cents extra. Still chugging along on my ABC challenge. :) Although technically since I didn't show you the "E" polish that I put on last at the beginning of the week. . . I've already failed. ;) I did have it on though. I just did not really enjoy my "Wet and Wild - Eggplant Frost" very much. Anyway! On to my "F" polish!! 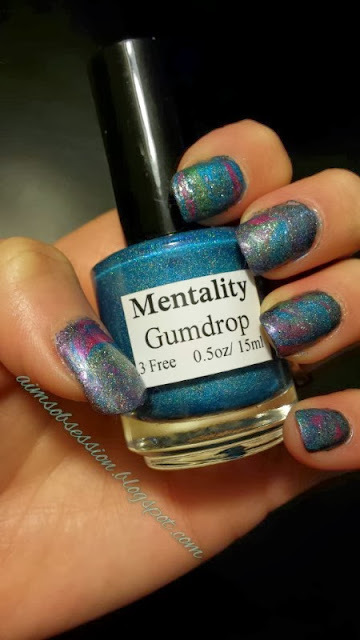 I had quite a few "F" polishes to choose from, but I'm a pretty huge fan of Mentality Polish so I chose to share Mentality Flirt with you today. 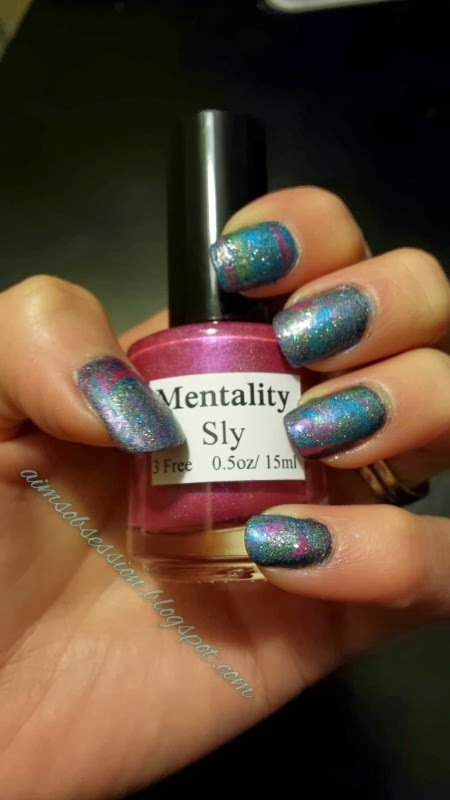 Mentality Flirt is a gorgeous soft red holographic polish that can be found in the "Specialty Holo" section of the Mentality Big Cartel site along with many other amazingly gorgeous holo polishes. There are quite a few newer polishes added to this section and if you are a fan of holos you should definitely check them out! I know I have my eye on them. Both photos above show a 2 coat application. 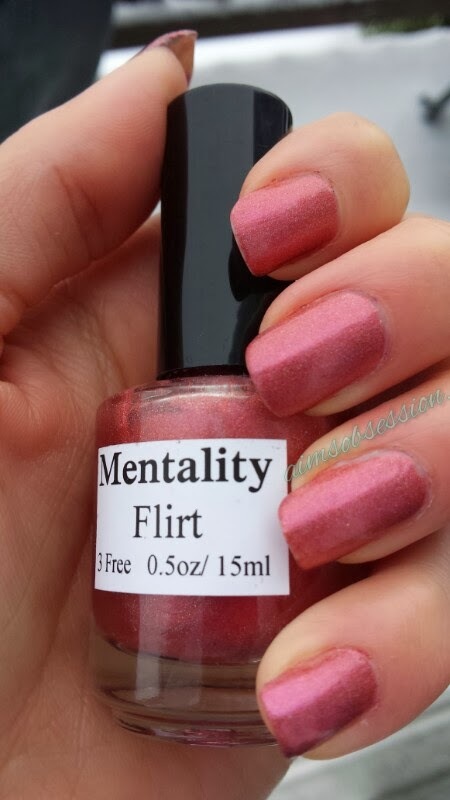 Mentality Flirt dries to a semi gloss finish so you really don't need a topcoat. I put one on out of habit. Above is Mentality Flirt in natural light, but the sun is not peeking out so I was not able to catch the holo. (Boo to winter and hiding the sun from me!) Trust me though, when the sun hits this baby. . . you will fall even more in love with it! If you love Mentality Flirt as much as I do, you should definitely go buy it! It is only $8.50 and domestic shipping within the US is free. Who can beat that?! 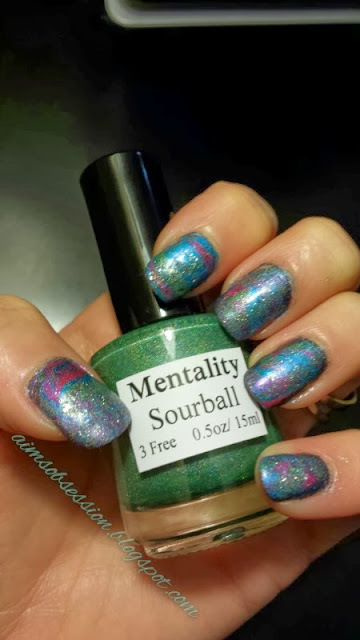 While you are on the Mentality Polish site be sure to check out their other polishes. All are reasonably priced and gorgeous. 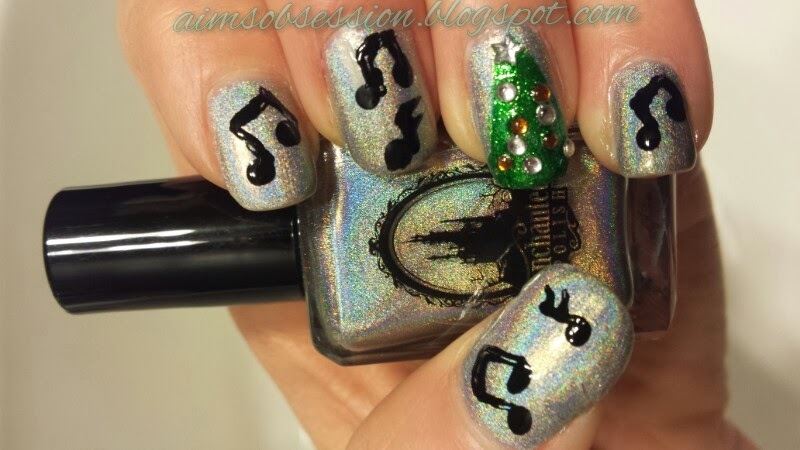 The lovely Leigh Anne of Polish Yer Hooves has joined together with Nailshine Journey for a Christmas nail art contest! The theme? Your favorite Christmas Carol. We all have our favorites! Use yours for your manicure inspiration. Rules are as follows: No stamping, stencils, stickers or tapes. Also, you must have it based on your favorite Christmas carol!! How fun does that sound? You have to hurry though! Entries are only being accepted until December 21. Winners will be drawn December 23. 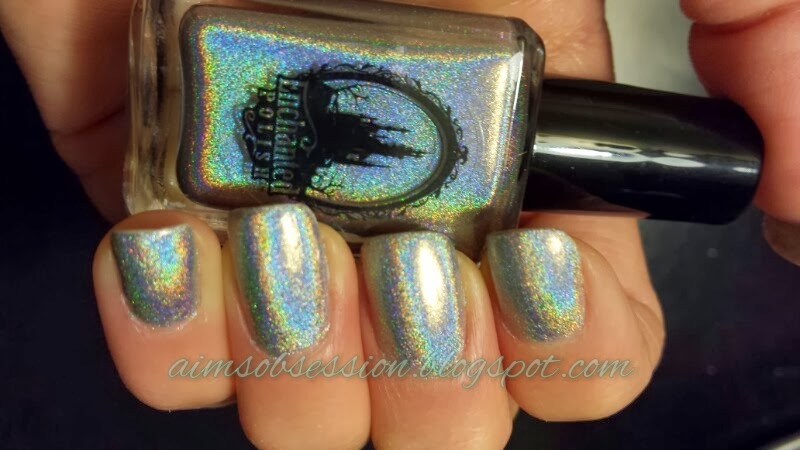 I was going to wait to use this gorgeous silver holo for New Year's Eve and you will see why in a minute, but I just could not wait! 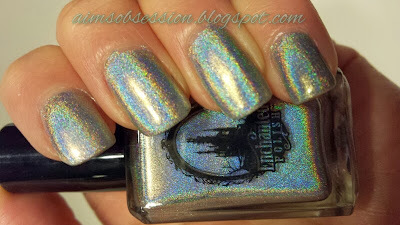 Isn't it the most gorgeous silver holo? Are the siren's calling for you now as well? Don't lie! I did not grab a picture in the sun, so both of these photos are artificial light. If I can capture some sun tomorrow, I will post the picture on my facebook page. If you have fallen in love with this gorgeous brand, be sure to go to Chelsea's site and sign up for her newsletter! She will send out a notice when her site will be restocked. Be warned though. . . they sell out fast!! So last night the girls and I had a "Moscato and Mani Night." I've hosted one similar before and it is always a blast. Here is the set up in the kitchen! Here is what my lovelies got me. Aren't they the best?! Not pictured is the gifts I got them, but it had: a manicure kit, a Julep polish, and some ghirardelli chocolates! Wait time between coats of polish is no problem when you have your girls to talk to while you wait!! 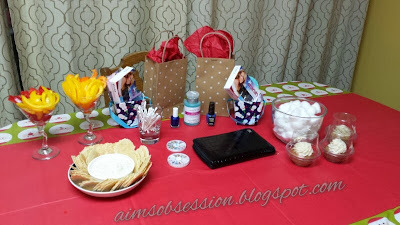 We were polishing, eating and chatting from about 7 pm - 1:30 am! What a blast!! I attempted some new nail art! The colors I used were: Chrome Girl - Worth the wait, Julep - Nina, Konad- white and black, Mentality- Gumdrop, and an off brand of silver polish that I got from Tjmaxx in the little girl section (it has no name but the bottle says "I love British Boys" and came as a set). Also incorporated into my design are rhinestones! Thank you lovelies as always for stopping by my blog! Please take a moment to follow me using one if the options on my sidebar if you have not already. :) Also, you can stop by my Facebook page and give me a like there! 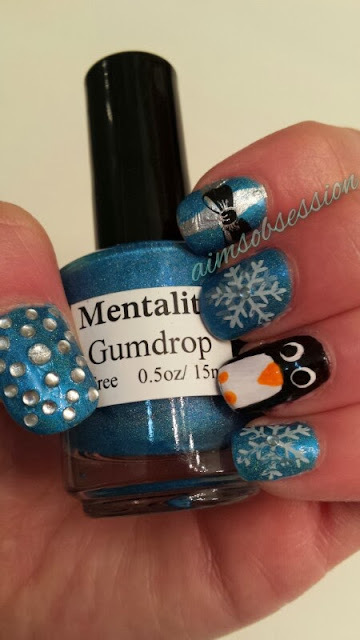 If you have any winter themed nails feel free to post them on my wall! I would love to see yours! As you know I had a little bit of a scare with Nova yesterday. Sorry I hadn't done a post. I figured I would share a little bit of nail art I did today. What better to cheer you up then some cookies? Have you started any Christmas baking yet? I know we have. :) Mint chocolate chip cookies (which are almost gone now!) I still have a few more planned to bake before Christmas. What about you? Edit: Almost forgot! 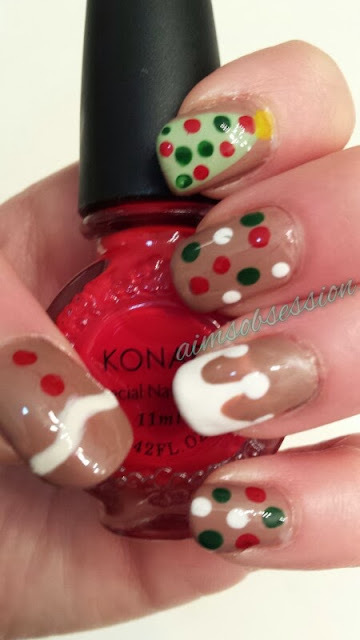 Polishes used are: Vapid Lacquer- quick dry top coat, Barielle - No not now, Gap- Hunter green, Konad red, Konad white and a Cosmo girl nail art paint. 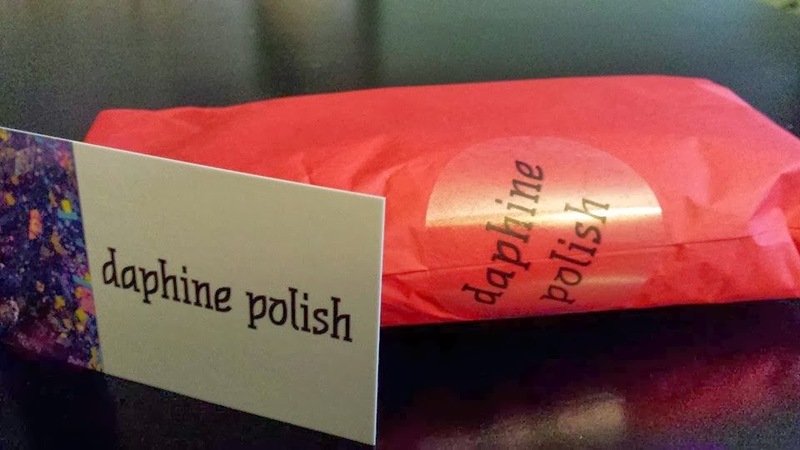 Not too long ago Joanne at Daphine Polish asked for bloggers to email her their information because she was looking for some new people to swatch and review her new holiday line. I took a shot (being a new blogger) at emailing her (So happy I did!!!) and she said she would love to send me some polishes to review! On the blog today are two polishes from Daphine Polish's holiday line. I hope you enjoy them as much as I did! First up is Rosina Violet. 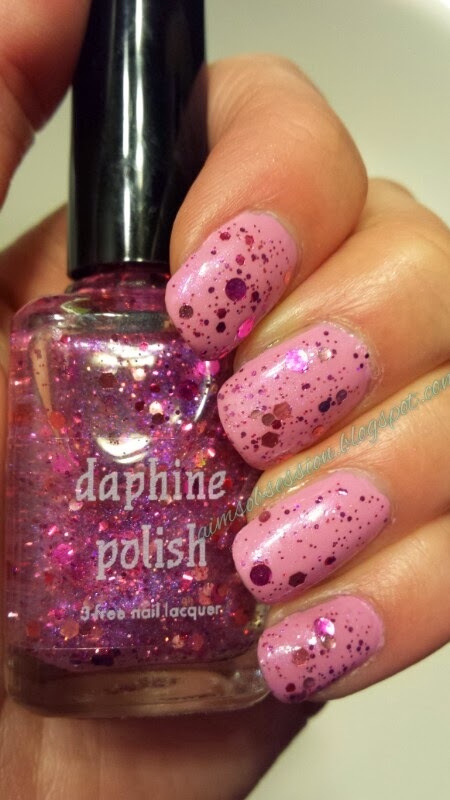 This polish is like a glitter explosion of beautiful different sized pink glitters in a clear base. It is named after the Rosina Violet, which is a delicate pink flower. I absolutely fell in love with this gorgeous glitter topper. The glitter was very easy to apply and I did not have to fish around for glitter, as the brush pulled out a multitude! I topped Rosina Violet over Gap- Kiss and Make up. I think the color combo looks beautiful. 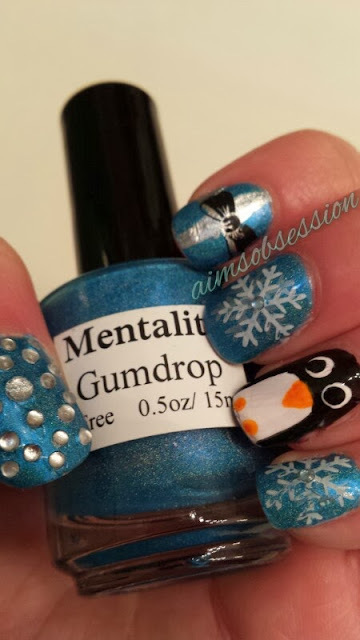 :) This glitter topper would look gorgeous over many different colors I'm sure. I can't wait to try it out on other polishes! 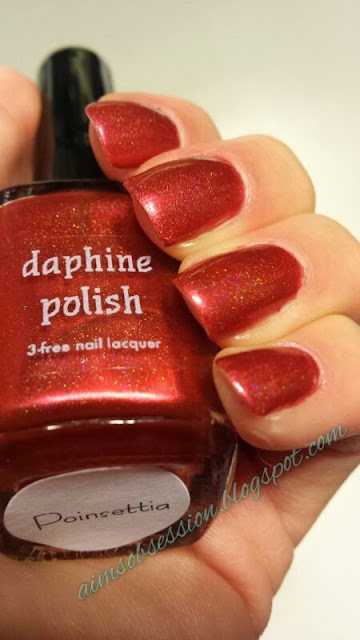 Poinsettia, as stated on Daphine Polish's etsy page, is: "A bold Christmas red loose linear holographic polish." I have been searching for a perfect red polish (some red polishes don't fit me very well) and I think I can stop my search! When I was in middle school . . . I played in the Orchestra and we always had a fundraiser around Christmas time where we would have to sell Poinsettias. 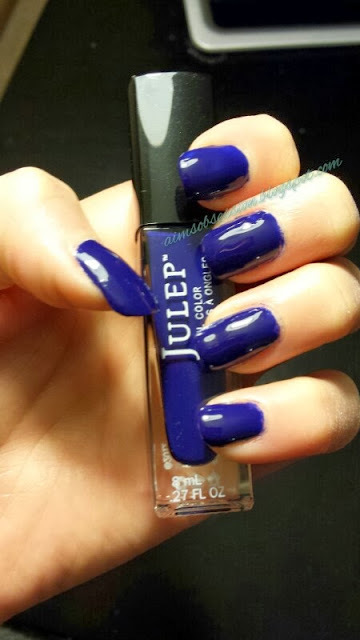 This polish not only reminds me of those beautiful plants, but also helps me take a trip down memory lane! Thank you again for stopping by my blog! I hope you will follow me using one of the options in my side bar! You can also stop by my facebook page or instagram for updates! 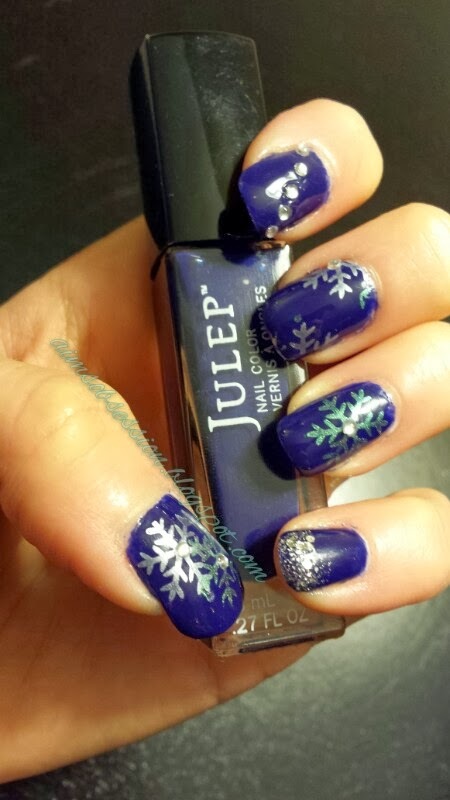 Winter is swiftly approaching and I felt it appropriate to do a snowflake manicure. Unfortunately, it does not look like snow will be here for quite some time. Is there a snow dance I can do? I have been itching to try them out! I definitely recommend looking into the Mentality Polish line for stamping if you are looking for fabulous colors to choose from. Their stamping polishes are only $7.75 each, which is a great price compared to the tiny bottles that you get from Konad or other brands! 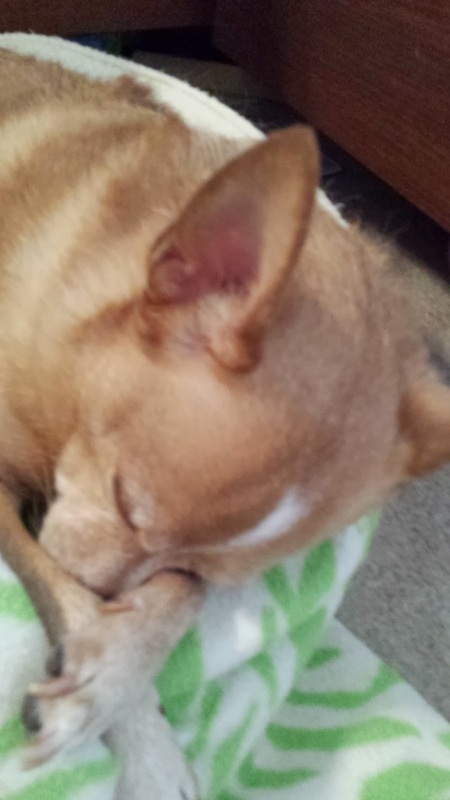 Thank you again for stopping by my blog. I hope you will take the time to follow me using one of the options in my sidebar. You can also stop by my Facebook page and show me some love there! ;) I would love to see your snowflake manicures! Feel free to post them to my wall. Today on the blog we have some more nail art. 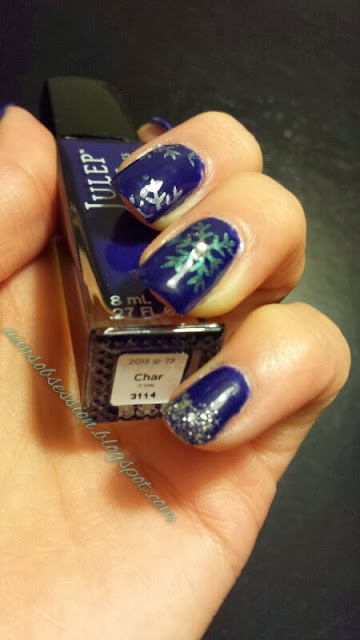 I asked on my facebook page whether I should attempt a northern lights mani or something snow related. Most people said northern lights so here is my attempt! I used Mentality polish and Shimmer Polish on this manicure. While not in love with my results. . . especially because cleanup was awful (and still not completely cleaned up) due to using the water marble method. I do love the colors. What do you think? Does it remind you of the Aurora Borealis?